Well, we're back home again and missing the beach already! We had an absolutely wonderful vacation with our friends and look forward to next year's trip. 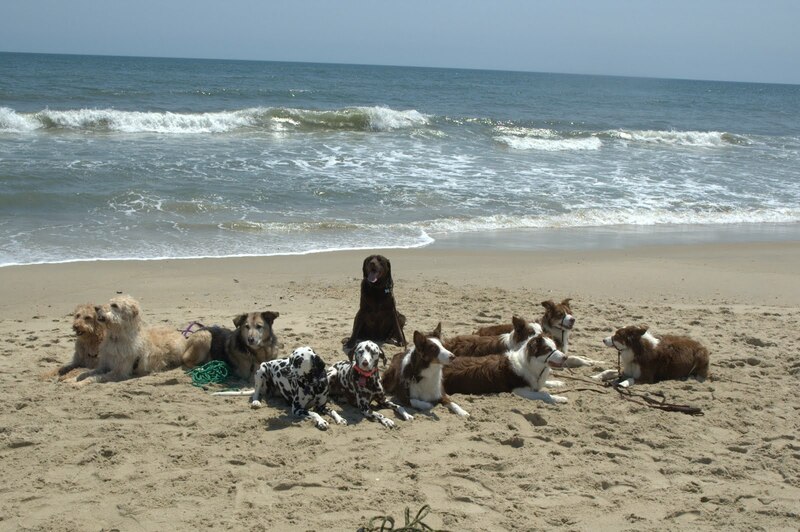 The weather was fantastic, and the dogs will have a "beach hangover" for the next several days, I'm sure. Jazz and Tess enjoy the sunrise from the deck of our beach house. Of course, the highlight of the week was all the playing, wrestling, and digging at the beach, as well as wading into the surf. Here's Jazz and her buddy Ian on the beach. Ian's family has five dogs, but he's always been partial to Jazz, ever since she was a puppy. 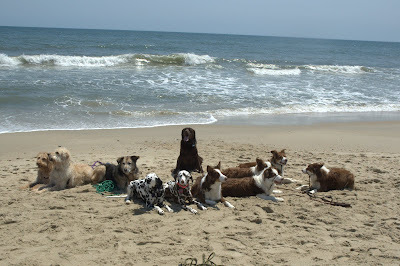 Here's the whole group of dogs that we traveled to the Outer Banks with: Labradoodles Shaina and Toby, Rocky, Tess, Jazz, Sammie, Chocolate Lab Heath, and Border Collies Swirl, Twist, Scorch, and Blizzard. So after a week at the beach, we ended up with very tired, happy Dalmatians! The girls are still sleeping it off this morning, but they had another fun adventure in the Outer Banks this year. Road Trial Training...at the Beach!! Yesterday, Jazz and I had the opportunity to do some road trial training on the beach in Frisco, NC! I had called Hatteras Island Horseback Riding, because their website said they specialized in customizing your riding experience. Well, what I was looking for was custom, all right! The owner, Jeff, was very interested in the concept of Dalmatian Road Trials when I described it to him (he is training one of his horses for endurance riding events) and agreed to allow Jazz to train with his horse Gus. Here's Gus and Jazz. Gus is a 9-year-old Norwegian Fjord Horse. He was an absolute delight to ride, and he really liked having Jazz along! They greeted each other nose to nose several times, and Gus even playfully goosed Jazz in the bum, which got tail wags and a play bow from Jazz. I'm absolutely thrilled with how comfortable Jazz is around horses. She has a healthy respect for these big critters but seems totally at ease with them, also. Here's Jazz on a down-stay getting ready to practice the recall exercise. Here's our recall...wait for me, here I come!! Here's me and Gus and Jazz riding off into the sunset (ok, so it was morning, but it sounded exotic) after an exhilarating training session at the beach. Many thanks to Jeff, Susie, and Alex from Hatteras Island Horseback Riding for "customizing" my ride to include some road trial training for Jazz. It was such a pleasure to meet them and Gus, and we look forward to seeing them again next year! It was another beautiful day on vacation in the Outer Banks. We headed over to Ocracoke Island today, where there are awesome beaches! Here's Jazz and Tess in the back of the car while on the ferry from Hatteras Island to Ocracoke Island. Both girls enjoyed the ride on the ferry and the ocean breezes. Even though we were trying to snap this photo, Tess and Jazz were more interested in the birds just up the beach from us. They had a wonderful time on Ocracoke Island, where there were only two other people on the beach during the time we were there. It was like having our own private beach in paradise!! Taking a break on a bench at the beach access on the way back to the car for the ferry ride back to Hatteras Island. The girls are now snoozing off their adventure at Ocracoke, but tomorrow's another day and another adventure! We're back in the Outer Banks at Avon, North Carolina, for our beach vacation. Tess and Jazz were very excited to be here again! Tess and Jazz on the dune. Woo-hoo! The girls love to play on the beach. Tess and Jazz dig the Outer Banks...literally! !